The holidays are arriving very soon, and I am on the search for that special bottle of affordable holiday wine for your upcoming feasts. After all, someone has to do it. 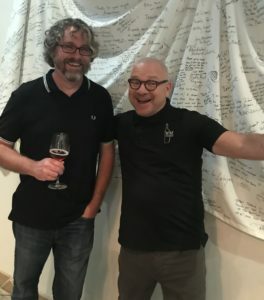 Fellow IFWTWA (International Food, Wine & Travel Writers Association) met at the Wine Exchange with Kyle Meyer, the Director of Purchasing, and Tristen Beamon, Director of Operations. More importantly, these two guys know their wines. The two of them travel all over the world sampling wines. 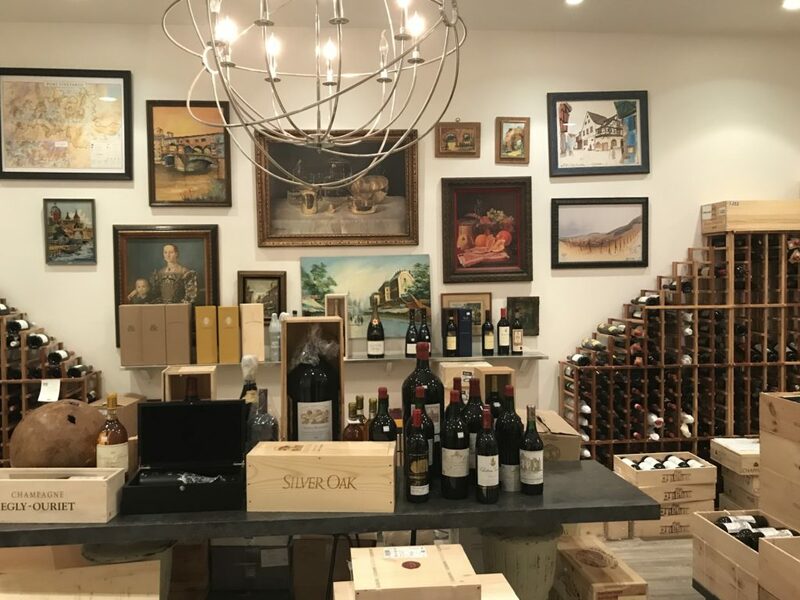 The Wine Exchange has rooms and rooms full thousands of bottles of wines from around the world. Every wine in their store has been tasted by Kyle and Tristen. photo) where the wines are priced as high as the Champagne Boerl & Kroff Brut Rose Magnum for $5,499.98. I am in awe of this little slice of luxury and have to visit it every time I go to the Wine Exchange. They believe, and I agree, that every holiday should start with a sparkling wine. Their choice to begin the festivities is the Sanger Brut Grand Cru V Blanc de Blancs Terrior Natal ($44.98.) 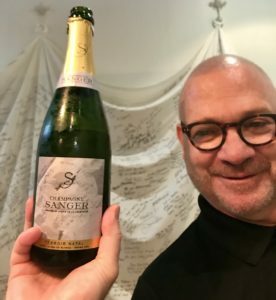 The interesting story about this Champagne is a school was created in Avize, France, called Avize Viti Campus. In 1952, the students and teachers along with local cellar masters and winemakers, collaborated to produce a Champagne at the school. Aging has taken place for 60 months (the minimum being 15 months.) The champagne is an extra brut and comes off bone dry but has fruit notes of citrus and apple as well as red berries and some spice. Great wine, great story. expect. In fact,”feinherb” means a semi-dry wine. 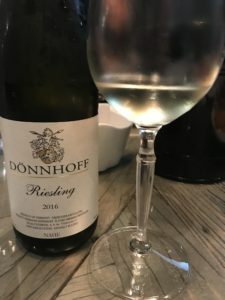 We thought this wine could be a great aperitif or it can pair well with turkey and ham. It would be good with those cranberries on the table, too. There are flavors of lavender, violet and red currant in this well-priced wine. 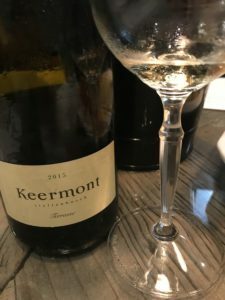 Keermont Terrasse was a group favorite. Next up was the Cleto Chiarli Lambrusco de Sobrara Vecchia Modena Premium Secco 2016 ($14.98.) Lambrusco has been given a bad name from the days of Riunite from the 70’s and 80’s where we were told to drink it over ice. This is not your mother’s Lambrusco. It has been awarded 93 points by James Suckling. This lightly sparkling wine from central Italy has flavors of strawberry and pink grapefruit as well as some citrus and a nose of wildflowers. A perfect accompaniment to turkey is a pinot noir, and we tasted a good one for that special day. 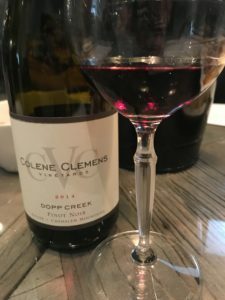 The Colene Clements Vineyards Pinot Noir Dopp Creek Chehalem Mountains 2014 ($24.95) is such a wine. On Wine Spectator’s Top 100 list in 2017, the balance on this wine is impeccable. As a good pinot noir should be, there is red currant, raspberries and violets with an earthiness to it that Oregon pinot noirs exude. The finish provides a hum rather than a flatness–a round mouth feel of smooth tannins. I am bringing this wine with me to Connecticut for Thanksgiving. 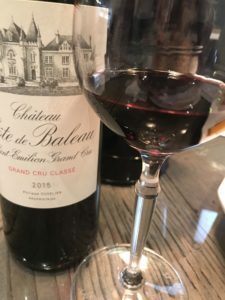 The Cote de Baleau wine is a great example of what the Wine Exchange looks for when bringing wines to their store. The Cuvelier family are owners of Clos Fourtet, a First Grand Cru Classé of Saint-Emilion. This family knows how to make great wines. 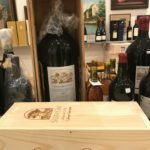 The Wine Exchange offers their consumers the experience of tasting wine made by great wine makers at an affordable price. The Wine Exchange is located at 1544 East Warner Avenue, Santa Ana, California. Their phone number is (714)979-1509. To see what they offer online for shipping, go to: https://www.winex.com. Happy holidays and happy wine days.